When I was making the master Highway 89 image files, I downloaded some new camera profiles that Adobe released for their Camera Raw functionality. Once I got familiar with them, using them completely upgraded my Raw conversion workflow. First, download and install profiles from Adobe Labs. One install will make the functionality available in both Lightroom and Photoshop. The Camera Calibration panel in both software packages will list several options in the “Camera profile” pull down menu. (The Adobe Labs instructions has a screen shot). Before, I followed the normal Raw conversion workflow: begin with the first slider in the basic adjustment panel and work downward, so that each effect cascades in the order the software engineers intended. What I do now is cycle through the various choices in the Camera Calibration tab first. As the example above shows, even the color balance can be dramatically altered by the selected camera profile. Often, I can get very close to my intended final image just by choosing the right profile. Then I go back to the sliders to adjust white balance, exposure, clarity, saturation and so on. Even though much of the Highway 89 book was landscape photography, I almost never used the Camera Landscape setting, finding it just too saturated and contrasty. Oddly, the Camera Portrait setting often works well for outdoor scenes. In both Photoshop (I’m still using CS3) and Lightroom, the Camera profile menu options change slightly depending on the camera body that made the file being processed. The D2X files begin with the ACR 4.4 option, while the D700 files start with ACR 4.6. 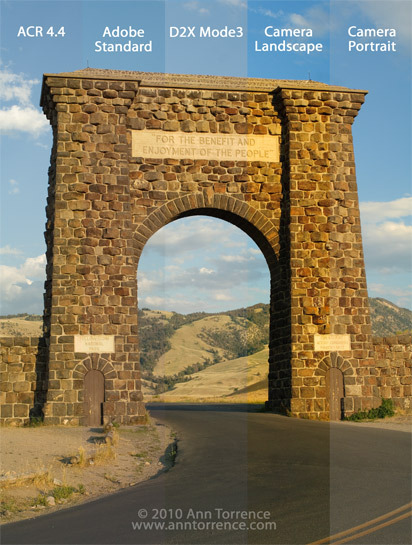 The example above was made in Photoshop using a file made with my D2X, a grain elevator in Wilsall, Montana. Now that I am using Lightroom to ingest my files and do my Raw conversions, I discovered that I like the ACR 4.6 profile for the D700 files much better than the Adobe Standard profile, which is what Lightroom defaults to. I set my Lightroom preferences so that all my D700 files open in the Develop module with the ACR 4.6 profile selected. Ian Lyons has a short tutorial on how to set up different Lightroom defaults for each cameras, including the ACR camera profile. When I started using the camera profiles, I liked the results so much that I ended up remastering most of my 2007 and 2008 Highway 89 images for the book. Now that I use it all the time, this one simple tool has dramatically sped up my workflow, and combined with the rest of the ACR tools, gives me even more control on my final outputs. It’s too bad the functionality is buried so deep in the ACR panels, because it really should be the first step in any Raw conversion workflow. Here’s hoping the Adobe engineers move it to the top of the stack in the upcoming versions of Lightroom and Photoshop. 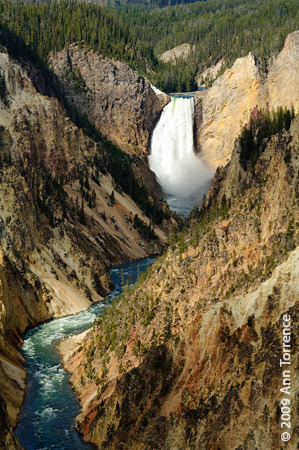 This image needs a home, because there’s only room for one Lower Yellowstone Falls image in the U.
S. 89 book. This isn’t the one, but calling it a reject just ain’t right. So what trumps this picture? I won’t say it’s better, just that the one I picked works better in the context of the Wyoming chapter. 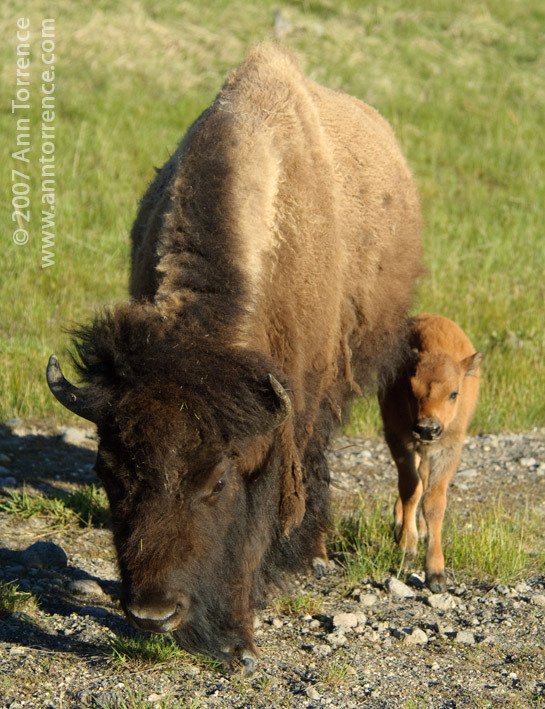 It will be the Highway 89 print of the month for July. I think it’s worth waiting for.